We are well know for growing some of the most amazing pumpkins anywhere. 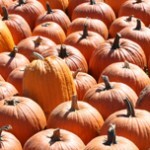 We have a huge selection of unusual pumpkins and gourds in an array of sizes and colors. White, green, speckles and orange are all waiting to be made into your favorite Jack-O-Lanterns! Gourds come in all colors, shapes and sizes also. All pumpkins are sold by the pound. Just to name a few pumpkin varieties that we grow!